This compact and attractive set made full use of the possibilities offered by the new 39XX chassis. The cabinet was slim and elegant, and could be made attractive from all angles, partly because the cool-running solid-state electronics generated much less heat that the valve circuits in the older models. The controls were also well styled, with the sound and picture controls grouped together in two drawers above and below the tuner pushbuttons. 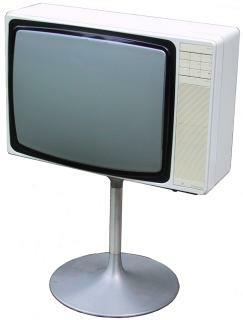 The tuner buttons were combined with the power switch, so the selection of any programme also turned the set on. The tuning controls were hidden in a door which opened out with the loudspeaker grille. Text copyright © Beocentral. Unauthorised reproduction prohibited. Small and slim for a colour set, the Beovision 3500 could easily be stood on a table or shelving unit. Its light weight also made possible the use of the aluminium trumpet-shaped stand that had previously been offered for the Beovision 600. Text copyright © Beocentral. Unauthorised reproduction prohibited. The Beovision 3500 was replaced by a very similar looking set fitted with the new 20AX tube, the Beovision 3802. Text copyright © Beocentral. Unauthorised reproduction prohibited.